The Safeway near me was having their 12 hour Grand Re-Opening Event Saturday so I ran over to scoop up some sweet deals. 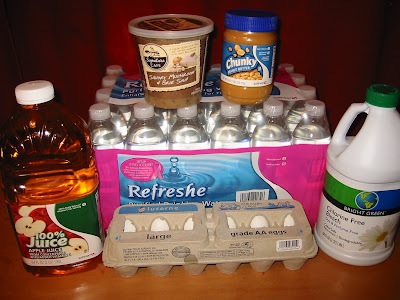 HFTH Deal: $8.06 after coupons, catalina and rebate! Total OOP: 18.06 and received a $5 catalina! Plus, I will send in for the $5 rebate through Real Simple! So after dividing up the $5 catalina between the 11 items my cost for 6 bags of Chocolate chips was $3.10!!! That’s just $.05 per ounce compared to Costco’s $.12/oz. Today, Sunday is the last day to purchase anything for the Real Simple rebate, so hurry in and do this deal if you need chocolate chips! Go here to see the rebate info and other qualifying products. I love these grand re-openings! These coupons were mailed to those near the 122nd & Powell store and are also available at the store. They were handing them out on Saturday, but I would imagine they are at customer service now. They are all good through 1/1/10. There is also a $10/$50 purchase coupon in the same booklets at the Free items, but this coupon does say after manufacturer coupons. Since I was more than halfway there after the HFTH promo and buying apples ($.49/lb.) and bananas ($.25/lb.) I knew this was the perfect time to buy cat food. $9.99 for a 18lb. bag -$10/$50 coupon = free cat food! To boost my total without more coupon matching I planned on buying 2 bags. To boost my total even further I decided to buy a magazine to put in a gift box that I am filling for a soldier serving in Iraq. I was planning on buying one to put in it so this was the perfect timing to do so. Along with everything I have already listed I also bought a loaf of Artisan round bread for $.49(coupon) and a dozen donuts for my 1st grade Sunday school class I teach. Those were just $1.99, also a coupon. So I had used my calculator at the store and double checked my math to make sure I did the HFTH deal correctly and met my $50 total after coupons. I had it figured to be $50.92. Unfortunately, as many of you know from experience, things went wrong. The total came to around $50 after the $10/$50 coupon. I knew something was wrong but as there were hordes of people there I figured I’d pay and then deal with it at customer service. So I had her take a bag of cat food off, since I didn’t need it to be over the $50, and ended up paying $39.22. I did receive my $5 HFTH catalina, so that was nice. Well, what happened was: most of my free coupons didn’t scan! The manager was less than patient, not mean or rude, but hurried and not willing to make sure I was credited correctly. She ended up giving me $11 back in cash but after more careful inspection at home I was still shorted out of $1.86. This just reaffirms that I need to hand the cashiers my coupons ONE AT A TIME. I think that is the only way to be sure something doesn’t slip by. Now here’s the even funnier part of this long and drawn out saga. 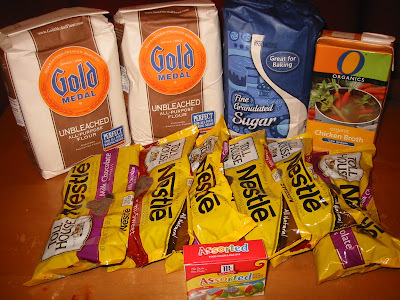 I ended up buying two extra Nestle baking chips more than I was needing to. I actually bought 8, not just the 6 I have above, but after getting home and realizing my mistake I planned to take the two back and getting a refund. Well, upon even further inspection of the receipt I found that they only charged me for 7 bags and not the eighth! They shorted me $1.86 in coupons, but I received a bag of chocolate chips priced at $2.50 (did not use coupons) for free. But I also bought an extra bag of chips for $2.50 and did not use a coupon. I also didn’t actually spend $50 before the $10 coupon once she gave me the $11 back. So: do I take my chocolate chips, kids and receipt back into Safeway to give them their extra bag back, while returning the other one and also trying to get my $1.86 back in coupons? Or do I just leave it all alone knowing it was not even my mistake (other than grabbing too many bags) in the first place. I definitely don’t want to cheat Safeway out of anything, but I also don’t want to be inconvenienced even more from their mistakes. What would you do? Not at all related to your moral dilema – but rather about the Grand Opening Coupon books at the 122nd and Powell store. I was in that general area today so stopped in and asked at customer service about the coupon books – the woman said they were gone by 10 am on Saturday, and there were no more. They also did not have a single Sunday insert to spare – since I hadn't been planning to shop I didn't have mine, so I ended up leaving empty handed – except for a few peelies I snagged while cruising the aisles for discarded coupon books that is. The store is beautiful though – that remodel puts the Gladstone "Grand Re-Opening" to shame! If you are concerned about them throwing it away….when you go to the store and if they determine they will take it back, ask what they do with it? If they say they have to toss it, then just pay for it! Karma…. make cookies with the chips, and give them to someone to cheer up their day. 9 out of 10 times, I have errors on my receipts. Safeway seems to be notorious for errors. I make a product that is in 150 stores, and I know how much the stores mark up my product, they make way more profit than I do. I feel things happen for a reason, so us this as a chance to pay it forward! follow your conscience. don't make excuses. take it back. doesn't matter what other people do with it…it's not your choice whether the food gets tossed out or not….it is your choice whether to be honest or not. Jennifer, sorry to respond so late, I've been gone all day. The catalina was from the Home for the holidays promotion. You can find the link under "weekly deals on the right sidebar. You have to spend $25 of participating products, of which the chocolate chips are and then you get a $5 catalina. It's definitely a good deal, just make sure to do it today and mail in the Real Simple rebate by the 19th. Wow, what a lot of great responses! THanks so much for so many kind words and for wise advice! So I'm torn between the "calling customer service and seeing what they would like me to do" versus "being a good example and a breath of honesty". My only reason to just call first is that I hate to think of something going to waste! Then there is the "customer service sometimes is more annoyed than grateful" aspect. I think I'll probably just wait till I go again, explain the situation, then ask them if they are going to throw it away if I/they could put it into a food barrel instead. Sound good?! Thanks again everyone!!! You have been blessed and are a blessing. Do what I believe you know is right or you wouldn't have asked the question…take it in. That in itself is a huge witness. From the other side of the counter, sometimes we ARE in a hurry, mistakes get made because we are all human, and I love it when my customers are honest. It makes me believe that there are still some honest people left in the world and if I have had a difficult customer, I tend to forget all about them! I would call them first. I once sent in a family member to shop and ended up getting UNDERcharged by 13 dollars. I called to make sure I didn't need to take it in the same day so the registers would balance out and she said just to bring it in on my next trip. Which I did. When I got there they said it was their error and to just let it stand. But then 2 trips later I got OVERcharged by almost the same amount… which I didn't contest since I was given a deal the last time. Why don't you give them a call and ask to talk to the manager. Tell him what happened and ask him if he wants you to bring it back. That way you have dealt with it the way the store wants you to and you know you have done the right thing. My first response would be to not worry about it, but everyone else had some good perspectives as well. I run into this same problem when I look at my receipt and see that they accidentally gave me an extra $2 off or made my item free off of the original price instead of the sale price. It's hard to know what to do since it was nothing that you did wrong! Now – slightly off topic… hand over each coupon one by one??? I try as hard as I can to pay attention and I will hand them over in batches, but I think a cashier might want to punch me if I handed over 20 coupons one by one. You guys think? that is to say, by doing what is right to begin with. We are accountable to God and He knows EVERYTHING. Do what's right before Him only. Basically it doesn't matter what we think. I would bring it to their attention with the intent of correcting the issue. More than likely they'll just say forget about it, releasing you from doing anything wrong. Rebecca- I have dealt with conundrums like this before.. it's tempting to call it a wash, call it a bonus, etc. I like Elizabeth's idea of calling- but, I think that an in-store, face to face confronting the truth is a bigger testimony. You can bring your receipt, explain that you were "shorted" but you were also "given" an extra bag. You wanted to make things right. I believe this will speak so much more to your character, and when asked for your reason- you have a God-created opportunity to share the reasons for your actions and your faith. 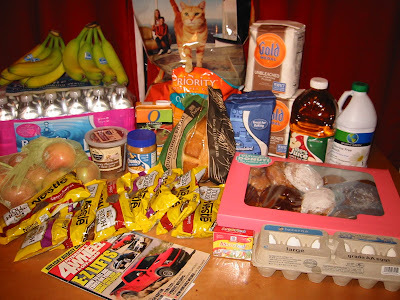 And besides, you are kind of the poster-child for our couponing. If the store identifies the Frugalliving queen as honest, seeking to correct and make ammends, I got to believe it is for a much bigger purpose!! Just a thought!! Seek to show God through all the actions in your life!!! I am all about being honest. However, in my experience with trying to "fix" a cashier's mistake, customer service is more annoyed with your efforts than anything. My thought is to call the store. Explain (a very simplied version) of what the cashier missed. If they did that to you, there has to be other people that had the same problems. They will probably appreciate your concern but will tell you just to keep the extra stuff due to the inconvenience. Somebody has to notify them when any area of their service is faulty. Good for you for caring!! I think if the store was going to trash them anyway, I would donate them if you felt too badly to keep them, however since they owe you $1.86 and they are worth $2.50, it is basically a wash. I think to be considered stealing there does need to be intent and there was obviously no intent on your part. Wow, what a story! I would let it be and if you feel guilty, you can donate it like the above comment said! Thanks for all the info you give us! This time of year, food bank needs are greater than ever! Let us know what you decide! I would wait till the next time you go to the store and go to customer service and make it right. Wonderful teaching lesson for kids to see! I have a 5 month old and I know how much trouble it is to take him around from store to store, in and out of the car, so I can only imagine doing that with 2! There were mistakes on both sides, and if the manager had been more patient and had better customer service skills then all of this could have been handled while you were still there. Plus, what they will probably say (I've had this happen before) is that there is no way to verify your coupons. You could tell them that they shorted you that much but there's no way to prove it to them since they shoved your coupons in the drawer and they're all mixed up with all the others now. I had that same thing happen at Target and they wouldn't refund me since I couldn't prove the value of my coupons. Ok, help me out here. In that first transaction shown, what did you receive the catalina for? I'd love to run out and buy chocolate chips if it's a great deal (uning the Real Simple rebate) but would I get a catalina too? If not, I think I'd rather run to another store showing their store brand choc chips are bogo. Let me know asap! Why don't you just call the customer service counter and ask them what they want you to do? They might think it is not worth the trouble… but regardless, you have done the right thing. I have to say that you should do the honest thing and take them back. You are blessed beyond belief and that is probably due to you following God. So, do the right thing. I know by you questioning it, you feel that you should take them back. I guess my question is what do you call theft? Is it knowingly taking something you didn't pay for? $1.86 or not it is what it is. I would just let it be also. I feel like for what they shorted you on will even out for the chocolate chips. Don't sweat it. I'd just let it be. Sometimes you're the windshield, sometimes you're the bug. In this case, you may have gotten to be both.